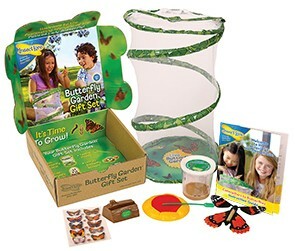 Exciting butterfly-themed bonus items make this butterfly-raising kit the perfect gift! The colourful flower-shaped butterfly feeder doubles as a handy cup holder while you watch the incredible growth of your caterpillars. Our Deluxe Chrysalis Station is a fun and handy way to hang your chrysalis while you wait for your butterflies to emerge. Beautiful 3D Butterfly Stickers are also included; these 2-layer stickers let you add glittery butterfly fun to almost any crafty project. They're great for decorating notebooks, greeting cards or scrapbooks. There's more - see how high your Wind-Up Butterfly can Fly! This rubber band powered flying toy will keep kids busy for hours. It's easy to wind and release. Also included are our fun buggy temporary tattoos!